As I punch the ball out of the hands of my opponent, I pick up the loose ball with Russell Westbrook and put the turbo on with a clear lane to the hoop. Westbrook, one of the best NBA players around, jumps up high above the rim and even adds a ridiculous flip to his dunk attempt, and as he throws it down with authority, the ball bounces off the rim and the opponent rebounds the ball. This is NBA Playgrounds, a game that has tons of flash and big names but clunks the ball off the backboard in a handful of key areas. NBA Playgrounds is a spiritual successor to the classic game, NBA Jam, as well as other inspirations like the NBA Street series. The game has you take control of two current or former NBA stars, in a two on two game where there are no rules, and the law of physics doesn’t apply. The controls in NBA Playgrounds are easy to understand, with the X button being used for shooting and stealing, Y for rebounding, B to push an opponent and the RT being the turbo button. While easy to understand, all of these actions use stamina from a players stamina bar. When the bar reaches a certain point, players can no longer do certain actions like use turbo or steal the ball. This leads to many moments where you just run out of stamina and are unable to basically defend at all or have enough stamina to finish a jaw-dropping dunk. The game also features power-ups that randomly give bonuses during the game, like automatically making your next shot and doubling the point value of dunks. All of these mechanics remain the same in all the available modes of the NBA Playgrounds. It has the usual quick game option, a tournament mode where players can unlock more players, via card packs, new courts and lastly an online mode. 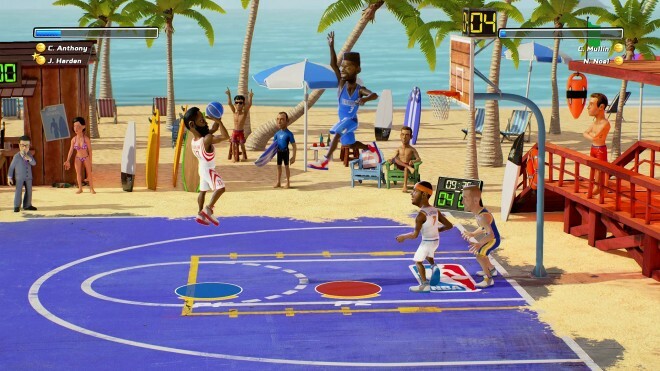 NBA Playgrounds has a fun core gameplay loop that can keep players entertained, but it is surrounded by mechanics and AI that will do nothing more than frustrate players. 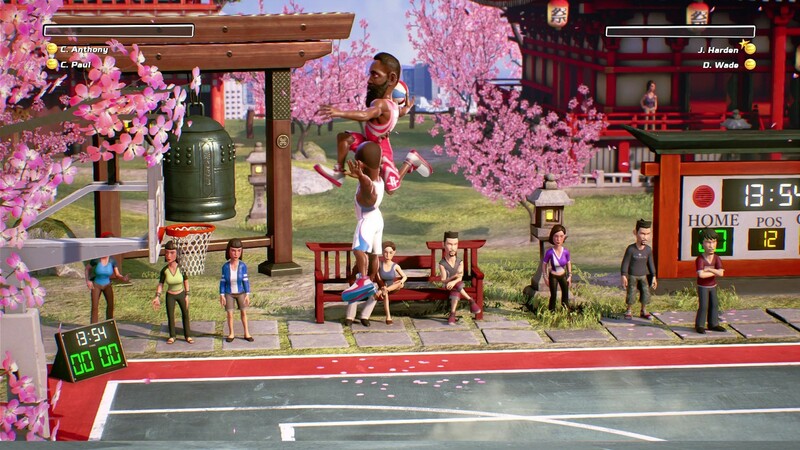 High-flying action – The best aspect of NBA Playgrounds is its crazy unrealistic gameplay. Watching somebody like Ricky Rubio throwdown a massive dunk is surreal and fun. Even shooting mid-range jumpshots and three pointers are entertaining in the game. There is something special about finding the perfect duo to take control of and taking on some of the greats in basketball history. It doesn’t get much better than when you’re on fire, and the opponent can do nothing but watch you drain shot after shot. It’s hard to get all of the enjoyment that the game has the potential to deliver, due to some annoying mechanics and random periods of not being able to stop anything an AI opponent can do. NBA Playgrounds is very much an arcade basketball game, that will remind some of the crazy action they witnessed in NBA Jam. 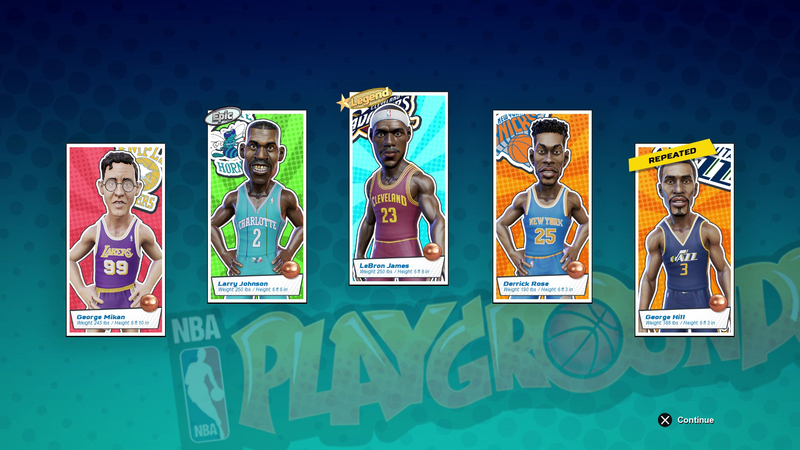 Playing with the best – NBA Playgrounds makes it simple and easy to obtain new stars to play as. 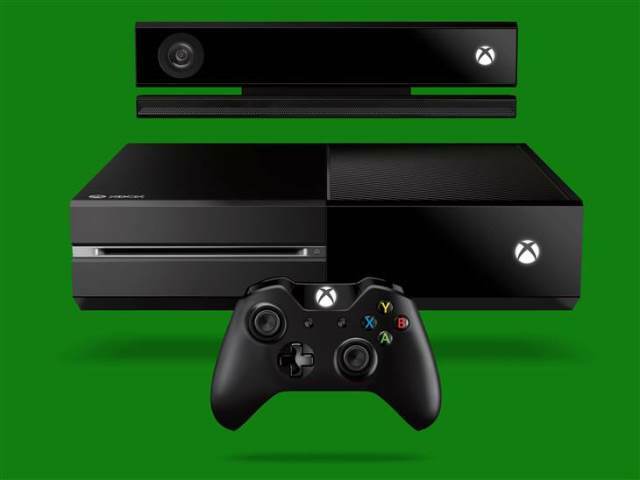 Every game that you play gives you experience with wins offering more experience. Each time you level up you are given a card pack that gives you new players. The game offers a good amount of current and former NBA players to choose from, with every current NBA team having a few players that gamers can choose from. While you may have to play a lot to get the players you want, due to the random card packs, there is plenty of talent to choose from. Having the opportunity to have Lebron James and Magic Johnson on the same team, and watching them do their magic helps set the game apart from other generic basketball games. Online shoving matches – The online game mode is almost unplayable a majority of the time, as the games quickly turn into matches of shoving whoever has the ball and making them turn it over. It can be infuriating to be a few feet away from another player and still get shoved and lose the ball over and over. By the time you actually get a chance to get a shot up, you will be as far away from the rim as possible and be hoping you can make a miracle shot. By the end of the game, both players will just end up mashing the shove button trying to force a steal, and whoever has the most amount of stamina remaining will most likely be the one scoring. 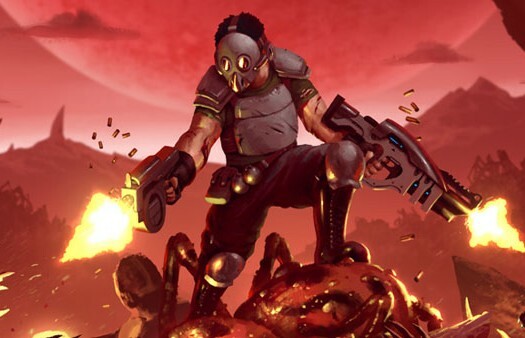 If you manage to get into a game where it doesn’t turn into a brawl, then there is a good chance that you will have some fun, but the odds of that at this point seem pretty small. The shoving mechanic basically breaks the game when it comes to online play, which is a shame since players can’t matchmake with friends yet, leaving you to hope that you find a decent player to play against. Stamina and shot timing – While things like stamina and timing a shot make sense for a basketball sim like the NBA 2k series, it doesn’t make much sense for an arcade basketball game. During my time playing the game, I’ve never once been glad that the game had a stamina bar for players as it usually ends up leading to more problems that anything. Sure, it may prevent players from mashing the shoving button or from trying to steal the ball every second, but there is probably a better option than the stamina bar that NBA Playgrounds offers. Along with the stamina bar problem, comes the issues with the shot timing mechanic. I’ve found it hard to figure out the best timing for a player’s shot. There are times where I feel as if I’m pressing the button too long only to see that I was early on the shot release, and there were times where the opposite happened. When I finally did manage to get a perfect shot here and there, I still didn’t understand why it had happened. It doesn’t help that getting a perfect shot timing gives a bonus of an extra point on the made basket, mainly due to the AI being much better at getting perfect timing on their shots. NBA Playgrounds has many small issues and problems that create a game that is equal parts fun and also frustrating. It calls back to classic arcade style games and in some ways succeeds in doing so, but it also fails in a handful of ways. The online mode is a no zone if you want to have fun at this point. However, the substantial roster size of NBA stars and gameplay that is entertaining to watch, and at times also fun to play, will make it appealing to those who want a different basketball experience than the usual sim. 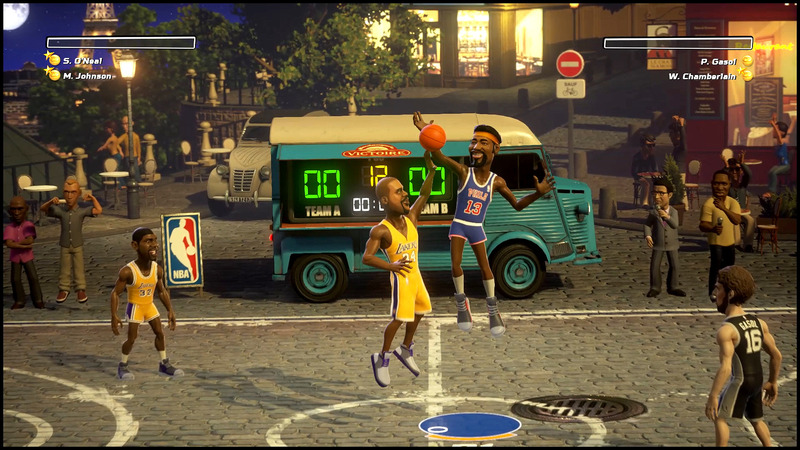 NBA Playgrounds was developed by Saber Interactive and published by Mad Dog Games on Xbox One. The game released May 9, 2017, for $19.99. A copy was provided for review purposes.